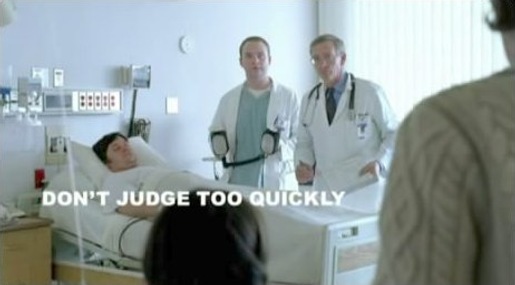 Ameriquest won the admiration of the Super Bowl viewers again this year with a new set of television advertisements featuring the “Don’t Judge Too Quickly” theme. TiVo reported that two Ameriquest spots were the most replayed commercials during Sunday night’s Super Bowl XL coverage on ABC. The American mortgage company are positioning themselves as the people who will understand their clients. Two doctors stand beside a patient in a hospital. The senior doctor, looking at his notes, says, “Patient has a fractured fibia. Given him a mild sedative. So he’ll be able to go home tomorrow.” The assistant is distracted by the buzzing of a pesky fly. In the elevator a woman says to her daughter, “Daddy’s going to be so excited!” Back in the ward, the assistant has taken the defibrillators and zapped the annoying fly. It falls onto the patient’s blanket. The assistant leans over to inspect the fly. “That killed him”, he says, just as the wife and daughter walk into the room. The doctors stand there, only now realizing what the family members must be thinking. A voice comes over the intercom, “Paging Doctor Palmer”. The voiceover and super remind us not to judge too quickly. Because Ameriquest won’t. A woman’s awake on a night time flight. She notices that the bathroom door has finally opened. Here’s her chance. But first she must get past two sleeping men sitting beside her. She catches her blouse on a latch and is just detaching herself when the plane hits turbulence. She’s thrown into the lap of the man she’s passing. At that very moment the lights come on. A woman and child across the aisle look at her with shocked faces. She realises what they must be thinking, especially as her blouse has become unbuttoned. The pilot comes over the intercom to say he hope that the passengers have had a happy flight. He informs them that the plane is about to descend. Once again, we have the voice over reminding us that Ameriquest won’t judge too quickly when we turn up looking for help. The Ameriquest ads were created at advertising agency DDB Direct Los Angeles by executive creative director Mark Monteiro, creative director Helene Cote, art director Susan Fukuda and copywriter Rebecca Rivera (Skies), art director Christianne Brooks and copywriter Rick Bursky (Doctor), and senior producer Vanessa MacAdam. Filming was shot by director Craig Gillespie, via MJZ with director of photography Tami Reiker. Editor was Haines Hall at Spot Welders, Venice, California. Audio engineer was Loren Silber at Lime Studios, Santa Monica. Flame Artist was Jim Bohn at Sea Level, Venice. Music was arranged by Soundelux. Take a look also at last year’s Ameriquest Super Bowl ads in my post at The Inspiration Room Daily, including Surprise Dinner, Parking Meter, Mini Mart, and Mother-in-law. Ameriquest in May 2006 decided to close all 229 retail branches and cut 3,800 jobs, in the wake of the subprime mortgage crisis. Apparently the company had taken the ‘We won’t judge too quickly’ approach too far. The parent company, ACC Capital Holdings, was bought by Citigroup in 2007.